2018 Dodge Demon SRT Challenger Already For Sale On Ebay! Even though it always seems like days since the news was announced about the pricing of the upcoming Dodge Demon, one is already popped up for sale on eBay. The official price will start at $84,995, but this doesn’t stop someone already speculating on the worth of this car. The ad. 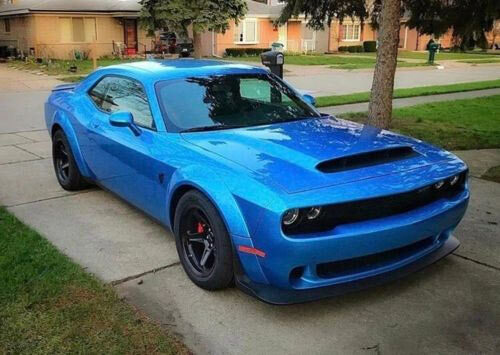 in question is selling the 840hp Demon for an eye watering $250,000, almost 3 times its initial value, but the main question here is, if the ad itself is legitimate. The seller has 23 stars and great feedback, but there are some caveats here. ‘Upon purchase we will discuss exactly how you would like to order your car if you purchase before the order date. If you purchase AFTER the order date then you will get the car with the options I choose. FCA/CHRYSLER DOES NOT OWN THE PICTURES IN THIS LISTING. The pictures above were taken by the public and show variations of the car. The way you order it is up to you.’ Says the seller. So this is a potentially legitimate listing, but if someone is going to pay three times the asking price straight out of blocks is another question. with only 3,300 units being made available to the public and future worth of the Dodge Demon expected to skyrocket, the seller may just get his asking price. If he/she does, it’s immediately going to give the rest of the vehicles, massive initial boost in its long-term worth. The question is, would you buy from this listing? Check it out here. ‘ The fastest production car that runs a 9.65 second quarter mile, does 0-60 in 2.3 seconds, and has 840 horsepower with a full manufacturers warranty is finally here. I have secured and locked in a 2018 Dodge Challenger SRT Demon. Before anyone jumps down my throat saying “Your crazy for the price your asking” just hear me out with the facts. They just released the MSRP and fully loaded it is just under $100,000. Now with that being said, that is the price before tax and before the inevitable huge dealer markup IF you can even get one at all! With that being said, I will make it short and sharp. They are only making 3300 total (3000 for the US) for only ONE year and this is your chance to own one. This is by far the most powerful, mean looking, rare, and ridiculous production car ever made. This ridiculous machine is for the true drag racers and true car guys at heart looking to purchase a future investment that will only go up in value. Upon purchase we will discuss exactly how you would like to order your car if you purchase before the order date. If you purchase AFTER the order date then you will get the car with the options I choose. FCA/CHRYSLER DOES NOT OWN THE PICTURES IN THIS LISTING. The pictures above were taken by the public and show variations of the car. The way you order it is up to you. It has broken just about every record for any production car and comes with your name born on the car, window sticker, and Demon crate. I used a different VIN because Ebay doesn’t allow you to post without one and of course I don’t have the VIN for the demon yet so please disregard that. You can visit YouTube to find out more in-depth details on this vehicle. 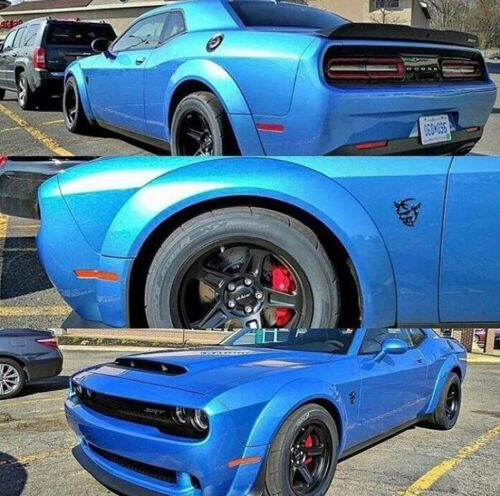 Related Items2018 Dodge Demon SRT Challenger Already For Sale On Ebay! Time will tell if there are any takers! There is always someone out there who wants something bad enough to pay top dollar!